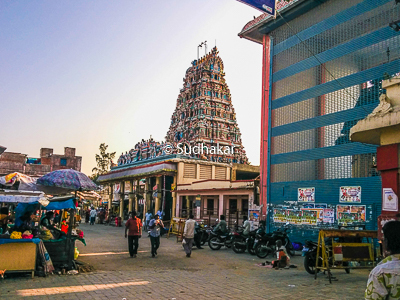 Sri Devi Karumariamman temple is in Thiruverkadu, a suburb of Chennai. It is said that Lord Muruga came here and obtained the 'Vel' (spear) from His mother, Goddess Karumari (an avatar of Parvathi) to fight the demon Suran and hence this place was called as 'Vel kadu' and became as Verkadu. As per legend Devi Karumariamman once disguised as a soothsayer visited Lord Surya, the Sun God, to predict His future. Not realising that the soothsayer is none other than Sakthi Matha, Surya ignored Her. Angered by his indifference, Devi Karumariamman immediately retreated. Lord Surya lost His glory and the earth plunged into darkness. Lord Surya then realised His folly and pleaded forgiveness from Devi Karumariamman. In order to pacify mother Karumariamman, Surya said that His rays would fall on Her directly twice in a year and touch her feet. (in the month of Panguni (March- April) and during (September- October)). Mother Karumari Amman is worshipped here in two forms.A swayambu (self manifested) with only head visible above the ground and another one in a graceful sitting posture with all Parasakthi features,with four arms holding skull,sword,trishul,udukkai (damru). 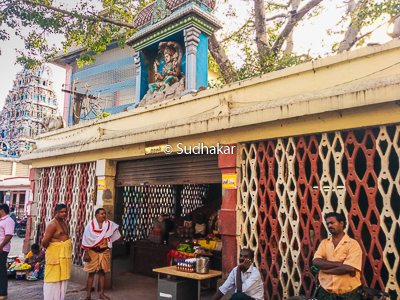 The Temple: Origin of this temple is said to around 1000 years old.At the entrance of the temple, is a sannithi for Lord Ganesha, under a tree, on the left of the flag post. As we enter the temple, we can see the Navagraha sannithi to the left and Sannithi for Srinivasa Perumal on the right. This temple has sannithis for Subramanya with Valli and Deivanai,Dakshinamoorthy, Mahalakshmi,Gayathri and Anjaneya.There is also a sannithi for Sage Agasthya. There is also a small temple tank , called Vedatheertham, in front of the temple complex. The tank created by Lord Subramanya is called as Thiruchamber Poigai. Taking a dip in the holy tank is said to cure people of skin related disorders. Rituals Gho puja( worship of cows) is performed everyday in the morning. Archana with Kumkum is performed daily between 4.30- 6.00pm.On the new moon day every month, a yagna with red chillies is performed. Brahmotsavam is celebrated for nineteen days during the month of Thai (January- February) and the deity is taken in a procession through the streets around the temple. The last three days, the Thepoutsavam (Tank festival) is celeberated. 'Yeka Thina' (single day) Laksarchana is performed on Thaipoosam (Full moon day in January- February) every year. .During the month of Masi Magam (January- February),the utsavar is taken to the sea for a holy bath. Garuda Seva to Lord Srinivas is performed on the eve of Vaigasi Visakam (eve of full moon day in the month of May). During the festival, Lord Srinivasa is taken out in a procession. Aadi festival in July- August is a major festival of the temple. 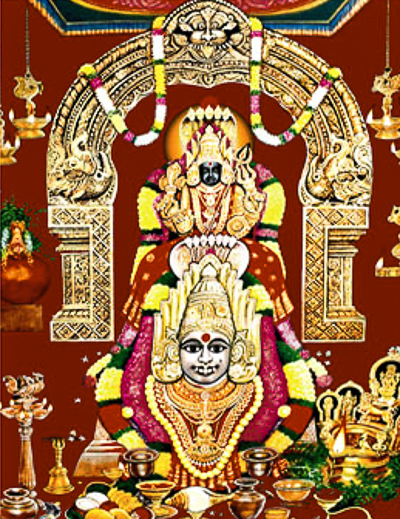 On Sundays, Ksheerabhisheka (abishekam with milk) is performed with 108 pots of milk. In the evening, the deity is taken out in a procession. On the 9th Sunday, the deity is taken in a flower palanquin. Navaratri during September- October is celebrated in a grand style with Devi in different Alankarams (makeover) on each day. During the Karthikai (November- December), Skanda Shashti is celebrated for eight days. The turmeric applied on Devi Karumariamman is distributed to devotees. It is said that the turmeric blesses unmarried girls a happy wedded life and childless couple are blessed with child. Temple location It is situated in Thiruverkadu, a suburb of Chennai. How to reach? Thiruverkadu is very well connected by road with plenty of local buses and autos,share autos plying there. From the heart of Chennai city it is around 15 kms.